Today marks the “big night” of the moulid (an annual religious festival to mark the birthday of a saint, prophet or head of a religious order) of El-Hussein. Hussein was the grandson of the Prophet Mohammed and the festival in his honour is held over three days on the grounds of the El-Hussein mosque in the heart of Islamic Cairo. This year, however, the celebrations have been overshadowed by false news that Sufi's were protesting against the destruction by Salafists of tombs of their Wallis (chosen spiritual leaders of Sufi sects) in governorates across the country. As for the current harassment by Salafists who have destroyed numerous Sufi tombs and sites, El-Qasabi insisted that “the Sufis are sending a message to transcend and bury our differences for the greater good of the country and avoid any room to divide Egyptian people. Moulids, denounced by puritan Salafists, have long been embedded in Egyptian culture. They encompass both the spiritual, through chanting and Zikr circles (assemblies of remembrance), and the secular, in music and street art. 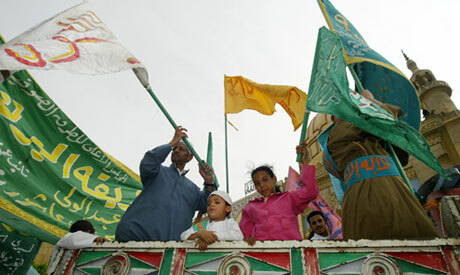 El-Hussein’s is one of the biggest moulids in Cairo, running for three days and drawing thousands of visitors. Celebrations include numerous Sufi chants, and Zikr circles. To mark today – the big night – renowned Sufi chanter Yassin El-Tohami will perform. With over 15 million followers in Egypt, represented by the council’s 74 orders, Sufis are described as the soul of Islam. Often referred to as “people of the truth” because of their emphasis on spirituality, modesty and a long quest to purify the soul, millions have been and continue to be attracted to their eternal path. In 2009, the serenity of the Sufi house was disturbed through a disagreement that made headlines between Sheikh Alaa Abul Azayem and Sheikh El-Qasabi over who should succeed the late Sheikh Ahmed Kamel Yassin as head of the Sufi Council.